A court ruling requiring officials to pass more water through the spillways of eight federal dams to aid migrating salmon and steelhead, rather than using the water to produce electricity, could increase monthly bills for Oregon Trail Electric Cooperative customers for part of the year. The decision Monday by a three-judge panel of the 9th U.S. 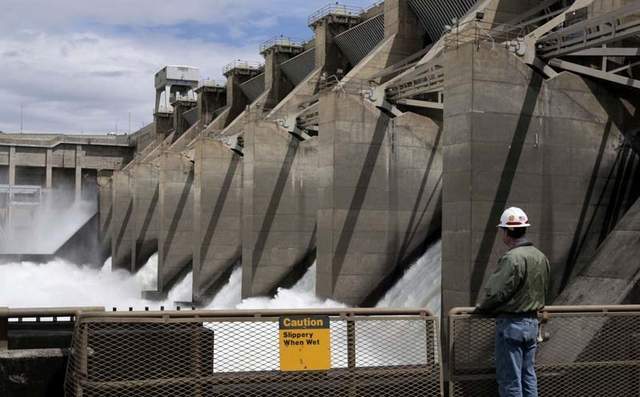 Circuit Court of Appeals affects four dams on the lower Snake River in Washington and four on the Columbia River. The release of water started Tuesday at the Snake River dams, and will start April 10 at the Columbia River dams. The Army Corps of Engineers, which operates all the dams, already boosts water flows through the impoundments during the spring and summer to aid fish, some of which are threatened or endangered, as they migrate to the Pacific Ocean. Conservation groups have advocated for the tactic of diverting more water over the dams because they say that's less likely to kill young salmon and steelhead than directing the water, and some of the fish, through the dams' power-producing turbines. Last spring U.S. District Court Judge Michael Simon ruled that the Corps of Engineers must spill more water between April and mid-June. The Corps of Engineers appealed Simon's ruling, but on Monday the Appeals Court panel upheld the judge's decision. The Appeals Court judges cited studies showing that more fish survive when more water is spilled over dams. The potential effect for OTEC customers has to do with the Bonneville Power Administration (BPA), the federal agency that sells power produced at the dams. OTEC buys about 99.5 percent of its electricity from BPA, said Anthony Bailey, the cooperative's chief financial officer (OTEC buys a negligible amount of power from a hydroelectric plant near Cove). In a press release Monday, BPA said the Appeals Court decision "creates a new multimillion dollar obligation for the region's ratepayers." Agency officials have previously estimated that the increased spring water spills could cost $40 million per year. "And that's not just a one-time shot," Bailey said. "It could continue for several years." Bailey said BPA likely will recoup its costs by adding a surcharge to the bills for its wholesale customers, including OTEC. BPA has estimated that OTEC's surcharge would be about $450,000 per year, and that the amount would be collected from May through September annually. Bailey said BPA could start assessing the surcharge as soon as this May. Although OTEC's board of directors will make the final decision, Bailey said it's "more than likely" that the cooperative would have to pass on the BPA surcharge to its approximately 23,000 members in Baker, Union, Grant and Harney counties. If so, OTEC likely would follow BPA's system and add a seasonal surcharge to customers' bills from May through September, Bailey said. He estimated the surcharge at about $2 per month for residential customers. "BPA could handle this differently, but right now that's how we see this happening," Bailey said. Opposition to the court-ordered increase in water releases from the dams is based on both economic and environmental matters, Bailey said. As to the latter, he said that depending on the volume of the spring snowmelt runoff, and its timing, the increased spills could reduce BPA's power generation so that it needs to replace that electricity, potentially with sources that burn fossil fuels and thus release carbon. Yet Bailey points out that many Democrats in the Oregon Legislature, as well as Gov. Kate Brown, have advocated for instituting a tax on carbon emissions even as the state government has endorsed the increased water releases from the dams. Bailey said it seems to him contradictory for Oregon officials to promote a change in dam operations that could lead to an increased reliance on burning fossil fuels. The most recent forecasts call for higher than average spring runoffs -- 16 percent above average for the Columbia River Basin, and 10 percent above average for the Snake River Basin. Bailey also noted that some opponents of the court-mandated spills contend that the change will imperil migrating salmon and steelhead by increasing the amount of dissolved oxygen and nitrogen in the rivers below the dams. High levels of dissolved gases in the water can kill fish.